Paths are arbitrary shaped objects. This chapter first covers some path terminology and how paths are described in Inkscape, then moves onto how paths can be created, and finally how paths are edited. Chapter 8, Live Path Effects (LPEs), covers effects that can be applied to paths. Paths differ from Shapes in that there is no predefined structure. For example, a Rectangle shape is defined in terms of a width and height with an x and y offset. A corner point can not be moved independently of at least one other corner point. A path, in the shape of a rectangle, consists of the coordinates of the four corner points. 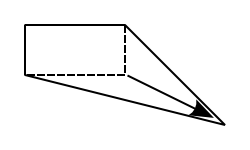 A single corner point can be moved by itself with the resulting shape no longer rectangular. 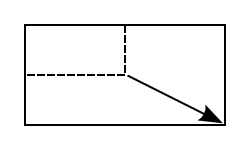 A Rectangle shape, shown before (dashed line) and after (solid line) a corner has been dragged. A regular shape can be converted into a path: Path → Object to Path (Shift+Ctrl+C), but the reverse is not possible.